Earlier this year, sales launched at The NOMA, a 55-unit ground-up condominium developed by Alchemy Properties and designed by Daniel Kaplan of FXFowle Architects. The 24-story building is distinguished by a gray-brick skin and ribbons of gridded windows that pay homage the area’s industrious roots. 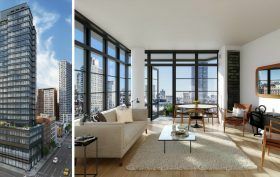 The “neo-Bauhaus” exterior references the older loft buildings from the early 19th century, the clean lines of the Bauhaus movement, and the massing of the parade of newer residential towers that have cropped up along Sixth Avenue in Nomad.